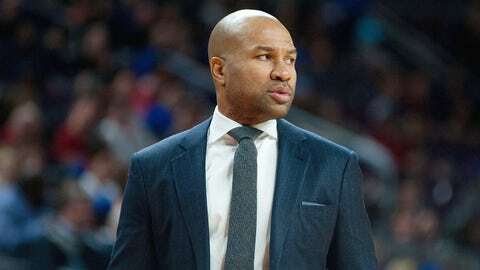 Will Derek Fisher get the New York Knicks headed in the right direction? Hope is part of what makes sports great. But there’s a fine line between hope and delusion. A non-NBA team believing it can knock off the New York Knicks seems firmly on that line — something approaching a punchline with just the right ring of truth. As basketball becomes more and more global, losing to international teams becomes less and less shaming. There is tons of hoops talent scattered around the world now, and a team that won just 17 NBA games last season is hardly in a position to think it’s going to win a contest purely because of the country in which it competes. As Berman mentioned in his piece, the Nets, who might be better than the Knicks, just dropped a preseason game to Turkey’s best team, Fenerbahce Ulker. Heck, you don’t even need to be a bad team to lose to a foreign squad. The Spurs—YES, THE SPURS—dropped their preseason opener just last year to Alba Berlin. And no one cared, mostly because they shouldn’t have. Guerra is right. His team probably can hang with the Knicks, especially during a preseason game, where intensity, adrenaline and competition are all a bit stifled.